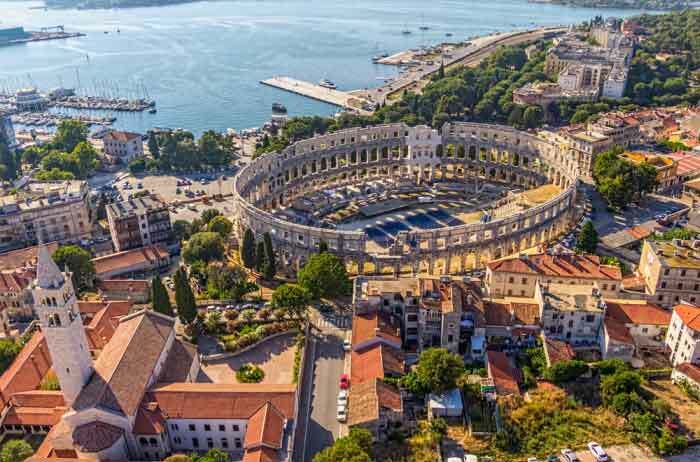 On the southern tip of the Istrian peninsula is Pula, still, the region’s largest and most important city, just as it was 2,000 years ago when the Romans chose it as their administrative base. In addition to tourism, shipbuilding at Pula’s Uljanik shipyard remains central to the local economy. 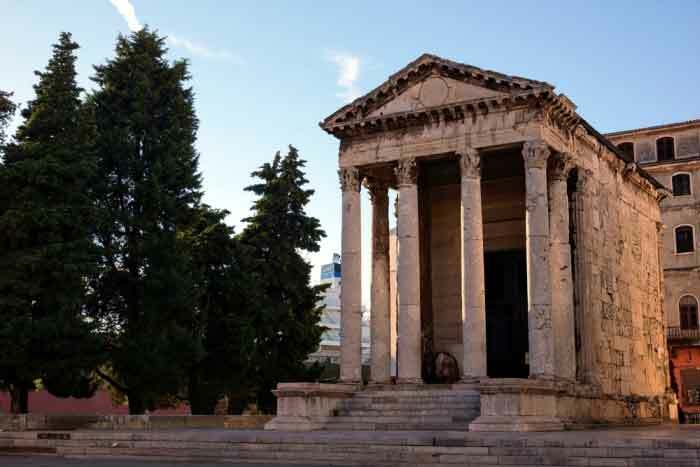 Ancient points of interest apart, Pula is an active commercial city on the sea that was able to keep an agreeable small-town charm. Only a few kilometers away to the south, many beaches are waiting at the vacation resorts that fill up the Verudela Peninsula. Even though marred with residential and vacation buildings, the coastline is filled with good smelling pine groves, seaside cafes and a many great restaurants. Further south down the indented coastline, the Premantura Peninsula holds an amazing nature park, the protected cape of Kamenjak. 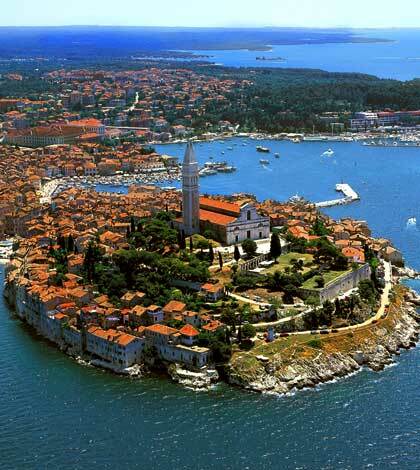 Just off the coast of Pula there are the famous Brijuni, a group of beautiful islands with holiday resorts, which can be reached by ferry. In the center of the town you will find the monumental 1st century Roman amphitheater, known as the Arena. This three-storey oval structure was designed to seat 23,000 spectators and is the sixth-largest surviving building of its kind in the world. Daily visits: Jan–Mar, Nov–Dec 9am–5pm, Apr 8am–8pm, May–June, Sept 8am–9pm, July–Aug 8am–12am, Oct 9am–7pm. During the 16th century, the Venetians carried off a good number of Istria’s Roman relics, and it seems that they even considered dismantling the Arena and rebuilding it in Venice. Today the ancient amphitheater – whose exterior is still remarkably intact – plays host to a lively program of summer festivals and rock concerts. 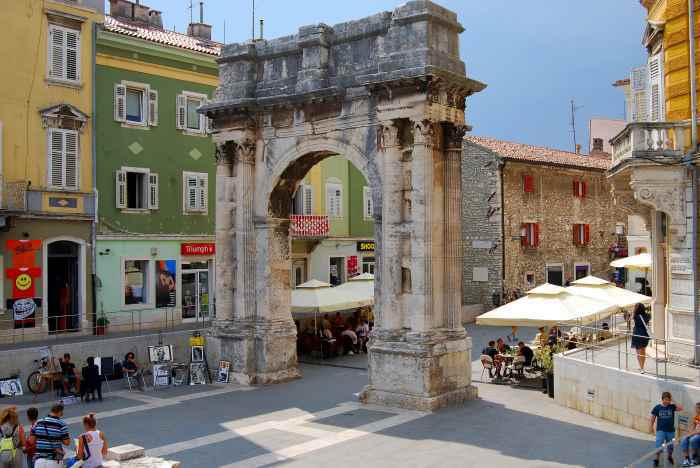 If you do a walking tour, from the Forum, Pula’s central meeting place from antiquity, take traffic-free Sergijevaca on the southeast corner to arrive at the imposing Sergius Arch (also known as Zlatna Vrata – Golden Gate), which was erected in 27 BC. Close by stands the house in which Irish writer James Joyce lived for a brief period in 1904–5 when he worked as an English teacher at the Berlitz School. In the same building is the pleasant Caffè Uliks (Ulysses ). Note the well-preserved Temple of Augustus that stands next to the 13th-century Town Hall. 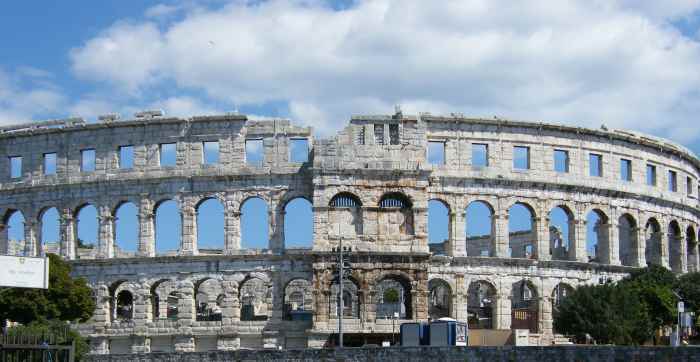 The Arena is surely the most famous and important monument in Pula, but in Croatia as well, due to the fact that is is the sixth largest and one of the best preserved Roman amphitheaters in the world. It is situated outside the old city walls because of its size and it hosts many events such as Film Festival, Opera Season, concerts and much more. Temple of Augustus, constructed between the year 2 BC and AD 14 and situated in the Forum changed its function a few times during the past: first, it was used for pagan ceremonies, afterward as a church and in the beginning of the 19th century it became a museum. Arco dei Sergi, another Roman monument, is a triumphal arch that was originally a city gate, constructed as a symbol of victory at Actium. Aquarium Pula is located in the Austro-Hungarian fortress called Verudela, situated on the peninsula 3 km from the city center. The aquarium is approximately 2000 m2 big and offers a lot to explore. There’s also a unique view of the entire city from the fort’s roof. Roman Floor Mosaic – impressive floor mosaics have been found in the remains of Roman houses after the World War II and have been well preserved since then, definitely worth seeing! Zerostrasse is the name of the historical site consisting of underground tunnels built during the World War I to shelter city’s population. Today, it is a touristic attraction and can be walked through, finishing in a photo exhibition that shows early aviation in Pula. 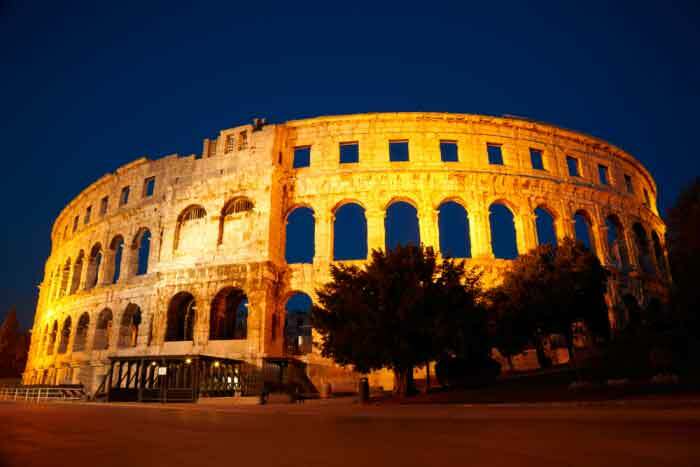 Go inside the Pula Amphitheater or take a two-hour guided walking tour that includes all most important historical monuments. If you are diving enthusiast, sea waters near Pula offers a wide choice of diving possibilities including wreck diving and boat diving. You can contact Orca Diving Center, located at Park Plaza Histria Hotel in Verudela for more info. Cycling is one of the most popular activities around flat coastline and gentle interior hills, offering exciting and relaxing opportunities for cyclists of all levels. 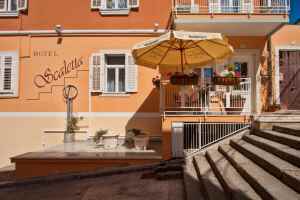 You can opt for several tours from a cycling tour and wine tasting through Kamenjak nature park, Premantura exploring secluded bays and sandy beaches or for more experienced bikers, try the full day Parenzana cycling tour that takes in the hilltop villages of Motovun, Groznjan and Buje. Book a boat trip with snorkeling or a kayak trip with snorkeling. Pula’s airport (www.airport-pula.hr, Ližnjan, Valtursko polje 210, p.p. 89, 52100 Pula, Tel. 060 308 308) is 5km northeast of the center, near the main Rijeka road. A bus service connects the airport to the main bus station (3-4 daily; departures timed to coincide with incoming flights); whereas taxis into the city will cost you 10 to 30 USD..There is one daily flight to Zagreb (40 minutes). In summer, you can find low-cost and charter flights from important European cities, such as with Ryanair and easyJet. The Pula Riviera offers many rocky and pebbly beach locations, along with man made terraces from where you can ease yourself into the crystal clear and soothing waters of the Adriatic Sea. The top beaches may be found in Punta Verudela, Banjole, Fazana and Premantura. In Medulin the Bijeca Beach even features a kilometre of sand on the beach. Watersports like windsurfing, kayaking and snorkelling can be organised locally. 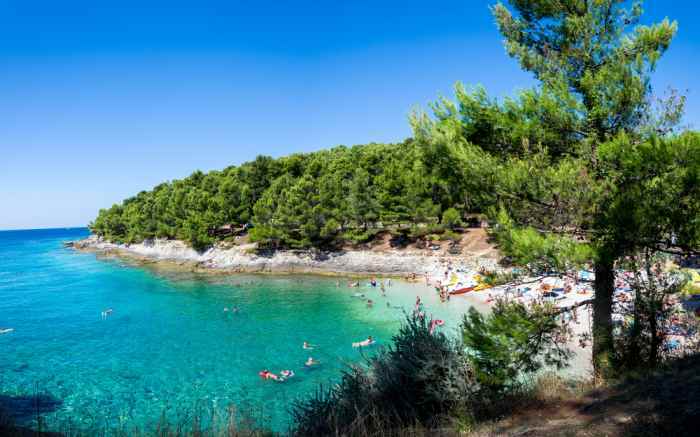 There are a few options if you want to spend the day at the beaches of Pula. The closest are on the Verudela Peninsula and reached by a short bus ride. Travel further south (8 km) to the Premantura Peninsula, and you’ll discover the protected nature park of Kamenjak which has small but beautiful beaches. Pula is surrounded mostly by rocky beaches. The most tourist-packed are unquestionably those around the hotel buildings on the Verudela Peninsula , even though residents are brave enough to appear at the small aqua green colored Hawaii Beach near the Hotel Park. For privacy, go to the wild Rt Kamenjak on the Premantura Peninsula, south of Pula. Istria’s southernmost point, this beautiful, completely not inhabited cape has pretty rolling hills, wild flowers, low Mediterranean shrubs, fruit trees and healing herbs, and nearly 30km of beaches and coves. For a little more style in the center of town, try this attractive family-run hotel. Rooms are somewhat small, but the cheerful decor makes up for the lack of space. The tastefully restored town house is just a stone’s throw from the Arena. This lovingly constructed and furnished boutique hotel not only has an award-winning restaurant but also beautifully designed contemporary rooms. 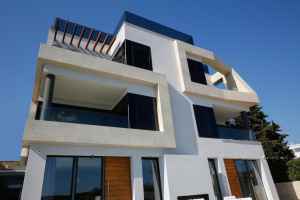 Overlooking the sea, 3km (2 miles) from the city center, it offers a beauty center and hydro-massage pool, plus a fitness center. A few steps from the Pula Arena amphitheater and Pula Marina, this hotel offers stylish, air-conditioned rooms with flat-screen TVs and free internet. Mediterranean cuisine is served in the restaurant. 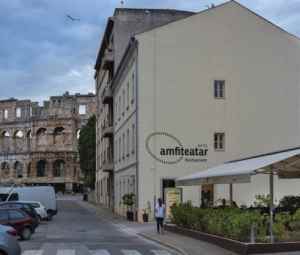 The Amfiteatar Hotel stands on the edge of Pula’s historic center, a 5-minute walk from Pula Cathedral and a 10-minute walk from Pula Ferry Port. Although built for mass tourism decades ago, this hotel on the Verudela peninsula has been extremely well maintained. The full resort experience includes several large saltwater pools, a wellness center and water sports such as water-skiing, scuba-diving and banana boats. Pula Croatia Map: Where Is Pula?